The HP ProLiant DL120 G5 Server is an entry-level rack-optimized server providing you with all confidence of a HP ProLiant server. The single processor, 1U server is ideal for single-application IT infrastructure, web and edge-of-network applications. The HP ProLiant DL120 provides two PCI-Express slots with an option to replace one PCI-Express slot with a PCI-X slot. Optional upgrades, including HP HBAs and Smart Array Controllers, provide support for SAS hard disk drives. An optional DL120G5 HP Lights Out 100c (LO100c) Remote Management Card provides cost-effective remote management from anywhere, anytime. Plus, you get the cost-effective solution of a single-processor platform with the performance advantages of dual-core or quad-core. 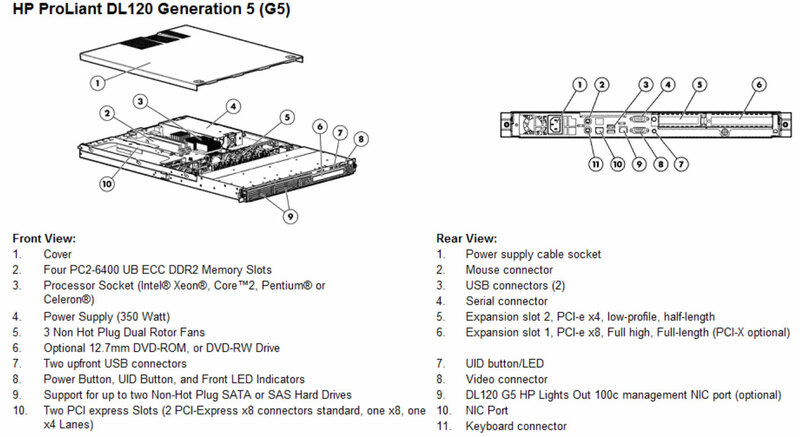 Call (425)869-6055 to speak with a Genisys engineer to help you spec the server/options for your needs!